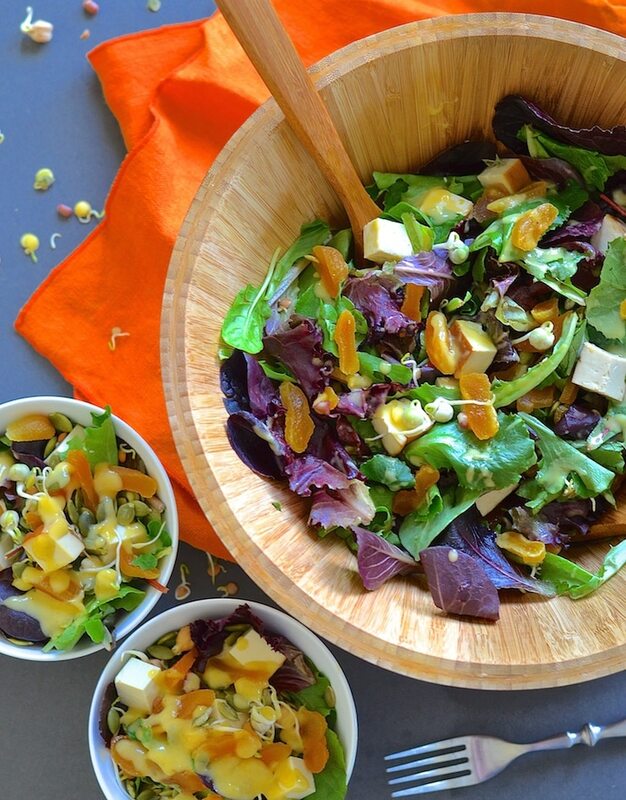 Smoky, smooth tofu, chewy apricot & greens, tossed in an awesome creamy Asian inspired, fruity apricot dressing. 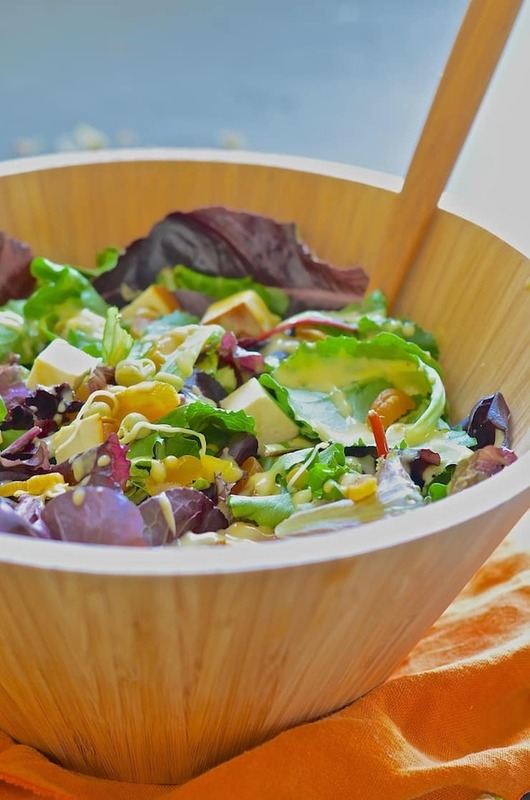 A healthy, fresh, vibrant & delicious tofu salad! Can’t stop, won’t stop with this super tasty tofu salad! All those flavours, textures and colours. it’s so pretty! In fact, tofu in general has become a bit of an obsession of late. 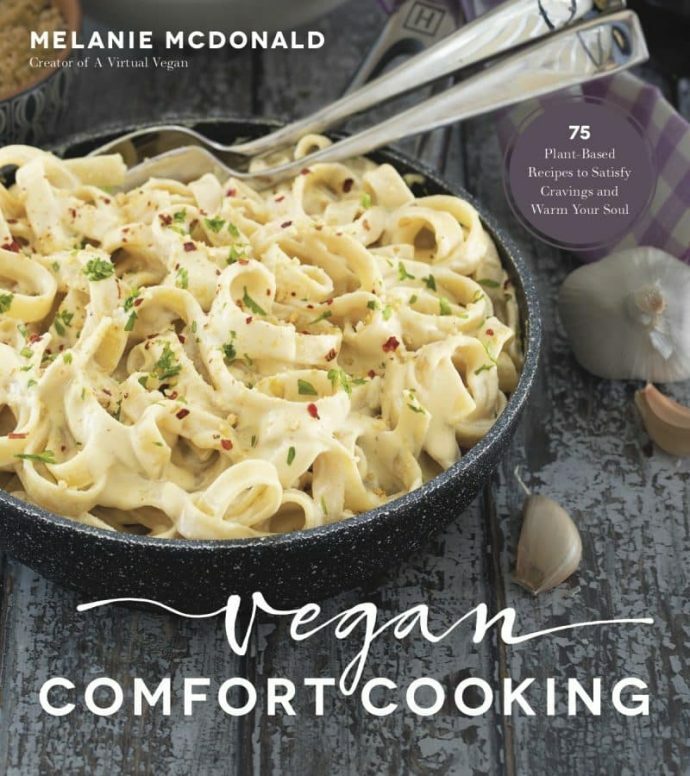 It has such a bad rep, but when done right it’s so good and I seem to have quite the collection of vegan tofu recipes going on. So let’s talk about this Smoked Tofu Salad situation. We’ve got delicious, smooth, smoky tofu cubes, tender greens, chewy dried apricot pieces, all tossed up in a fruity, sweet and tangy apricot dressing. 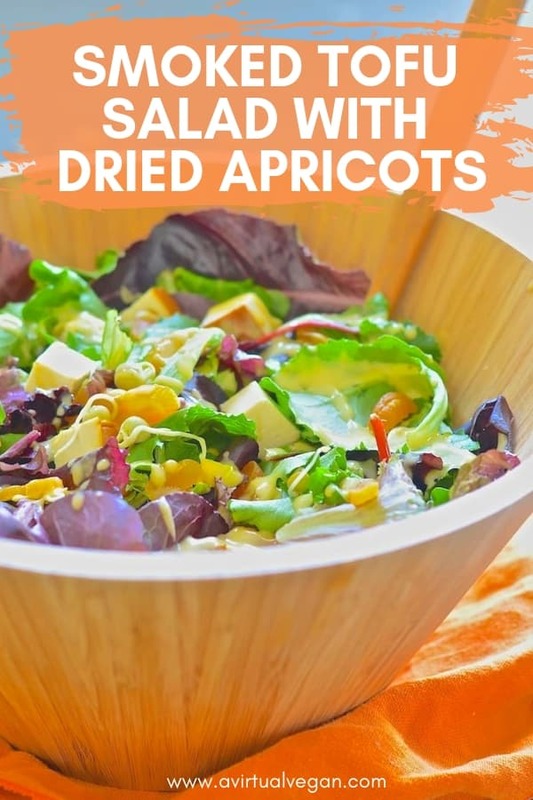 Dried apricots are something that I have never used in a salad before but they are so good in this. 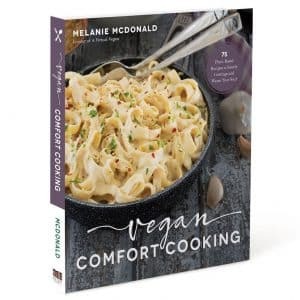 Their dense, chewy sweetness adds fabulous texture and compliments the smooth, smoky tofu perfectly. As well as tasting good they are also incredibly good for you. Although the drying process degrades some vitamins (like vitamin C), other nutrients become more concentrated. Because of this, dried apricots tend to provide higher levels of most nutrients than their fresh counterparts. They are high in fiber, iron, potassium and antioxidants. Yay for dried apricots! Apricots are used both in the salad and in the dressing, which they give it such a lovely yellow colour. The apricots also help to thicken the dressing and make it creamy. 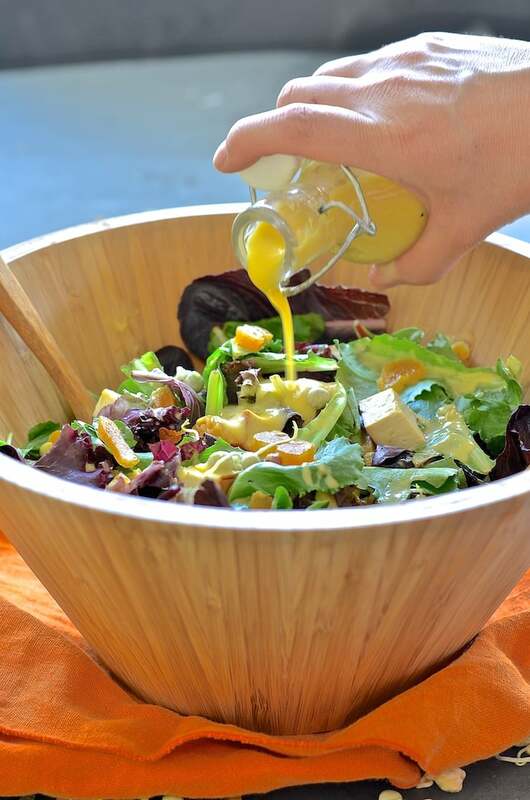 The dressing is thick enough to cling beautifully to the salad leaves. Rice wine vinegar, sesame oil and ginger, give it an Asian style flavour which compliments the smoked tofu and the apricot pieces perfectly. This beautiful tofu salad is what I’m eating lately, and I just can’t get enough. It makes a great light lunch or dinner. If you wanted to make it slightly more filling you could toss some cooked and cooled rice, noodles or quinoa through it. Dress only as much salad as you will be eating and store the rest of the dressing in a bottle or jar until it’s needed again. By doing this, leftover salad will keep well in the fridge for the life of your salad leaves. Smoky, smooth tofu, chewy apricot & greens, tossed in an awesome creamy Asian inspired apricot dressing. 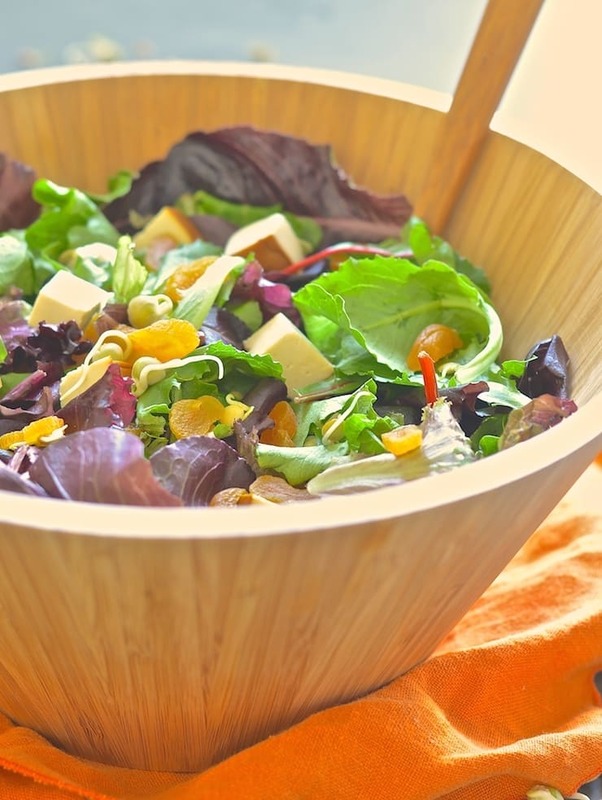 A healthy, fresh, vibrant & delicious tofu salad! Make sure your apricots have been soaked for at least 15 minutes in boiling water. Drain but reserve the water. Put the apricots and all of the other salad dressing ingredients into a blender and blend until smooth. Start with less water and add more gradually until the thickness is as desired. Dress generously with the dressing just prior to serving. Could you possible say the brand of tofu. I tried one that was awful. Thank you. 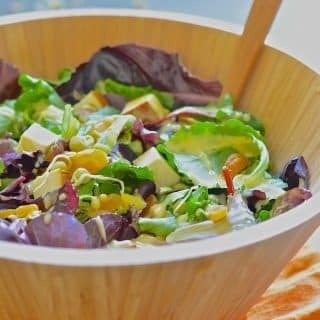 This is such a great spring salad! :-) I’m totally in love with smoked tofu!! Thank you Sina. Smoked tofu is just awesome isn’t it? The dressing sounds amazing, I love ginger so much! Flavors sound wonderful. Thank you Lucie. The apricots and tofu are such a great combo! Those flavors!! I’m dying. SO amazing. I’ve been so into salads these last few weeks. I’m totally putting this on my list. What a wonderful recipe! I love the smoky tofu and the apricot, and then I saw the dressing! What a fab combo! Thank you Patricia. And that dressing is so quick & easy. Who needs store bought dressings eh? I will definitely have to try my hand at that dressing, that alone sounds amazing! Though, I do love me some smoked tofu. And your pictures, I want to be in all of those trees! Thank you so much Jackie. The smoked tofu with the apricot dressing is so good. And yes, the trees are pretty amazing. We walked through them for a bit and saw a bear from a distance. I’m glad he didn’t decide he wanted to try the salad! What a beautiful hike and great salad. Thanks for the reminder to look for some apricots. So tasty! Thanks Kelly. Everyone should have some apricots in their pantry! This salad sounds delicious!! I love that it has tofu in it and the dressing sounds delicious. I love the sound of this, all those great flavors and textures! I can’t believe you whipped this up out of stuff you found in the fridge. The hiking spot looks lovely, and what a fun lunch to bring! Thank you Gin. I just love packed lunches! This looks sooo perfect – especially with the warmer weather coming!! We’ve been having a mini heatwave here in BC so salads are just perfect at the moment! The hike and the recipe look gorgeous! I love how you really stepped outside of the norm with the flavors. Thank you Alisa. It’s a combo I’ve never seen anywhere before but they go so well together. So beautiful! Both the trestle and the salad. I love all of the flavors going on in this. Thank you Aimee. The views are so good there! What a beautiful salad! I love dried apricots and smoked tofu..would have never thought to put them together. Sounds so good!! Oh yum! What a unique combination of flavors. My son will love this dressing. Thank you!I hope he enjoys it! 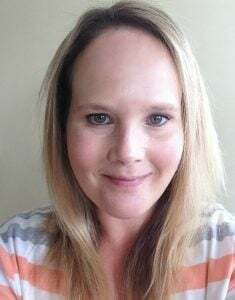 Love the sweet with the smokey! Such a great combo!